As I returned to the college after my holidays, the newly constructed speed- breakers caught my attention. Eager to experience how it felt, I went for a ride in the campus with my friend. 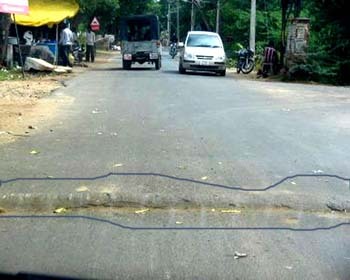 To my eyes the speed breaker looked like vestigial flab protruding from a sleeping hot south Indian actress’ hip. I pity all those bikers now who used to flaunt their riding skills. I also pity all those chivalrous knights who would whiz past 60 kmph with their dames by their side and race against the time as the clock struck 9:30 pm. However this has an advantage. Now the relative speed between me and those bikers would reduce, thus expanding the inertial perspective frame in which I could get darshan of the damsel. My mind hit by the speed breaker started to throttle in full gear. I began to wonder where else could we put a speed breaker. No, I thought. I felt there are several speed breakers which should be removed first. You need to remove the unwanted ones which hamper the progress before installing new ones. I looked at the black tar road. The black lump of tar reminded me of the black gown. It took 7 years to deliver the verdict for Jessica Lal when the judge had written in the report during the first trial that he knew who the murderer was. The speed breakers in the judicial system – inadequacies in investigation, shoddy prosecution and judicial lapses have made the people lose faith in the judiciary. When the local police officer catches you for traveling in trebles, the police officer gives you only two options. You can either pay him a bribe for fifty bucks or go to the court to be produced before magistrate who would fine you upto three hundred bucks. I don’t have to ask you which one you would go for. My mind which was entrapped in the atomic lattices of the crystals of tar began to diffuse. I began to think where I could install a speed breaker. My mind now got refracted by the glamour of the vehicle. Those curves at the right positions made me feel as if I was sitting in the laps of a svelte senorita in motion. My mind which got defiled by her beauty decided to think about the economics of her manufacture. Soon economics took my control and I began to wonder if our country’s economy needs a speed breaker. Now, wait. Don’t get me wrong. I don’t mean to install a speed break to hamper the progress of our economy. I wondered if we could put a reality check in the progress of our economy. Our Prime Minister Mr. Manmohan Singh seems very gung ho over the Capital convertibility issue. I personally feel he has been hitting the throttle too hard. The Argentine Crisis of 2001, the tequila effect- East Asian Crisis of 97’ and the Russian crisis of 98 took place due to hasty decision by the Government to usher in full convertibility of the currency. Though our economy has been doing well for the past few years, it would be churlish to introduce full capital account convertibility at this juncture as it would make the economy unstable. I came to my senses as my friend suddenly hit the brake. I wondered if I had encountered yet another speed breaker in my way. Not this time…I have reached the destination now.